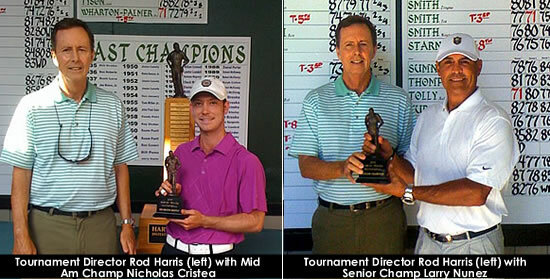 Nicholas Cristea got the last laugh Sunday on the final day of the Harvey Penick Invitational at Austin Country Club. Cristea's fellow competitors teased him all week about his youthful looks and jokingly questioned if he actually met the tournament minimum age requirement of 25. He turned 25 earlier this year. Cristea did not need to say a word in defense of his youth as his game did all the talking for him on the way to a four-stroke victory. Cristea's final round of 2-over 74 gave him a winning 54-hole total of even par 216. Chris Schmidt finished second at 220. Former Penick champion Michael Cooper posted the best score Sunday with a 2-under 70 to tie for third at 221 with Mark Healer. Cristea made par on the first seven holes Sunday, and after making birdies on Nos. 8 and 9, he enjoyed a five-stroke lead making the turn. Cristea admitted that he played somewhat tentatively on the back nine with the big lead, and that probably led to bogies on Nos. 12 and 16 and a double bogey on No. 14. However, nobody else within striking distance was making a move, and Cristea's lead was never less than four strokes. "Actually I struggled a little bit on the front nine and had to make a couple of putts to save par early," said Cristea, a former All-American at St. Edward's. "Then I had a short birdie at eight and a 20-footer for birdie on nine. I wasn't exactly sure how everybody else stood, but I felt like I probably had a pretty good lead. "I made a couple of more good putts to save par on the back but then had some bad holes," Cristea added. "But these greens are so fast it can get away from you pretty fast." Larry Nunez shot a final-round 76 to win the senior division with a 2-over par 218 total. Jarratt Jones posted the low senior round Sunday with a 2-under 70 to finish second at 220.